This is the story about my experience with the installation, service and use of a satellite video system. I've written elsewhere about my lack of confidence that new computer-based products will live up to their advertised glories. (e.g. Read about my Neo-Amish approach to telephony.) So what possessed a self-confessed videoholic like me to replace my time-tested cable TV reception with a new, higher tech video supplier? More recordings can be stored than on a VHS tape (my PVR's capacity is 100 hours). Recordings are displayed by program name and/or recording date, showing program information copied from an online TV guide. While VCRs record video on sequentially accessible tapes, PVRs record video on randomly accessible disks. With a PVR you don't have to rewind to a a show from the beginning. You can start watching a show from the beginning after recording has started but not finished, and the remainder of the show will be recorded. TiVo is the first major North American PVR supplier, and their name has become a generic word for recording video with a PVR. They make their profits not from PVR sales and rentals, but from subscriptions to software and services. PVRs from TiVo and the other digital TV signal providers (like Bell, Starchoice and Rogers in Canada) install software that allows you to select shows to be recorded from online TV guides, and to fast-forward while playing back recordings (which for most of us means zipping over commericals). That software (which to be more precise should actually be called firmware) has been designed by people who've thought about how it would be used, and is easier to use and less error-prone than that for old-fashioned VCRs. Using a PVR you can say good-bye to the irritating user interfaces that require you to pound away at up and down buttons to move between channels 3 and 62 or to set recording times and dates. Just press a button on the remote control to see the online program guide, scroll up and down through channels (or type the channel number), scroll right and left through times until you see the name of a target program. Then press Select to have that program recorded (accepting the default of having every episode recorded, or choosing to record only every new episode, or just a single program). When you've slected a program, you can press a button to see more guide info about it. But with over a hundred channels, searching through the guide to find a target program can be quite time-consuming. Fortunately with most systems (including Bell's) you can find programs by entering a program name using the remote control's telephone keypad (pressing 2 once for "A", twice for "B", three times for "C", etc), and SEARCH to find a match in the built-in list of upcoming programs, then SELECT to record that program whenever it's broadcast. And a history of your past searches is easily accessible. I began to plan my move away from cable TV by Googling "TiVO" and "PVR", which led me to a flood of information and hype from vendors, and raves and rants from users. After spending hours on web-based research, and after talking to PVR-experienced friends and relatives, I decided to dump Rogers, my cable video supplier of many years, and sign up with the satellite TV service provider Bell TV (who then called themselves "ExpressVu"). You can pay from less than $100 to over $2000 to buy a PVR with wide variations in functionality and storage capacity. Most of the PVRs  manufactured by Crutchfield, HUMAX, TopField, and others  are not available in Canada, some of them not even in North America. And because of the connection between PVR hardware, PVR software and the delivery of content, not all of those PVR's can be used with all video signal suppliers, especially in North America. TiVO is not currently legally available in Canada. The only truly useful Canadian PVRs are those bundled with the Bell ExpressVu, StarChoice, and Rogers Digital services. Some PVRs are able to record from any video source, including analog cable or even "off the air"; but the PVRs wedded to those three Canadian suppliers all required digital input. Using them would require a conversion for those like me still receiving analog cable signals. I chose Bell ExpressVu (aka BEV) in part because at the time their website provided more information than those of Rogers and StarChoice. Digital service from my longtime analog supplier Rogers would have been the easiest way to get to a PVR, as it wouldn't require the installation of a satellite dish, and I did at first considered using Rogers digital. But an unfriendly Rogers website blocked many of my questions, where information was often obstructed by visual and audio ads that I felt were shouting at me, so I quickly dropped Rogers from consideration. The StarChoice website was slow, and kept misdirecting me away from the information I was seeking. But the Bell ExpressVu website was slick and information-rich. And ExpressVu offered a two tuner PVR, with an "Extra Value" package that, for less than I was paying Rogers, provided all the channels and more that I was getting from Rogers ... plus a PVR! The lead installer, Louis, went down to the basement and up to the bedroom, surveyed the roof and formulated a plan. He would use two of the old co-axial TV cables already in the basement, and drill three holes to the outside: two holes for cables to the satellite dish and one for a power supply to the outdoor switch. He would install new hardware that included a dish on the chimney, two cables from the dish to the basement PVR location, and another cable from the dish to basement cables that already led to the second and third floor TVs. Using the second UHF remote, my second floor TV would be able to access all of the basement PVR's functions as did the standard IR remote in the basement. His helper brought in several boxes of hardware. In the basement he installed the PVR, and in the upstairs bedroom a standalone converter. Three hours later Louis and Ed were still working.  Mounting a satellite dish.  Supplying and installing ... materials to support one set top receiver.  Routing RG6 cable to the primary TV location.  Connecting and activating the receiver. That would include the two required direct feeds from the satellite dish to my Dual Tuner 5200 PVR/receiver. But would it also include installing a switch to feed my second floor TV? Or drilling a hole for power to feed the switch? Or drilling another hole for a cable to feed the basement link to the third floor TV? Well it turned out all of that was included in my free installation, which took two installers four and a half hours to complete! How does BEV make any money on this? Over my two year contract I am committed to paying $1658, made up of a $50 activation fee, $47 per month for programs, and $22.50 per month for the PVR and converter. In addition to over a hundred channels of TV programming, I got a Satellite Dish, a PVR they sell for $599, a converter valued at $99, miscellaneous switches and cables, a $315 programming credit, and over four and half hours labour by two installers. I later read online horror stories about missed appointments and shoddy installations. It seems I lucked out, and I was glad that I had given each of the installers a $20 tip. My BEV model 5200 PVR is a modified version of the Echostar model PVR522 distributed by Dish Networks, with whom BEV has technology sharing relationship. BEV made only minor changes to "rebrand" the 522's hardware and software. Dish Networks have recently replaced the 522 with the model 625, which has a 100 gigabytes more hard disk space, which Dish says is "additional capacity reserved for DISH On Demand programming". One of the first differences I noticed with BEV was a 3+ seconds delay changing channels on my 4100 receiver, and 5+ second delay on my 5200 receiver/PVR . With my analog Rogers cable service, the remote controlled channel-change delay was so small that I never noticed it. Is my 5200's five second delay excessive? Why doesn't the particular channel chosen seem to affect the delay? Why did another single-tuner PVR that I tested produce a 3+ second delay, just like that on my standalone, non-PVR converter (and not like the 5+ second delay on my own two-tuner PVR)? What is the channel change delay on StarChoice? Is there a channel change delay on Digital Cable? If you have answers to any of these questions, please send a message to the email address at the bottom of this page. If and when I get more information I'll post it here. As many wags have commented, the digital video service providers' on-screen guides are a far better way to deal with the several hundred channels available on the new digital services. "Channel surfing is so twentieth century! ", they say. But surfing is a way that many of us learned to cope with what seemed, even in the days of analog television, to be a confusingly large number of channels. Writing the data to and reading it back from the PVR's hard disk. Converting the digital signal for display on an analog TV. 1. Signaling the satellite dish. Unlike the old days of analogue TV, the cable attaching to the back of the receiver doesn't passively carry all of the channels, and a channel selection can't be accomplished by the receiver reacting to buttons you press on your remote control. The receiver must send a signal of its own up to the dish to cause it to do its thing. The satellite dish focusses the signals onto an LNB, or "Low Noise Block Converter, which amplifies the incoming signal and converts the frequencies used by a satellite receiver. All BEV LNBs are dual output, meaning they can feed two receivers. To allow reception by more than two receivers you can't just patch in a passive RF splitter; the LNB's output signals must be switched by an active component (like the 4-way switch from Eagle Aspen). The LNB receives even and odd channels with different "polarizations", and switching between those is accomplished by the satellite receiver sending out a different DC voltage (13 or 18 volts) over the coaxial cable to the LNB. That means that changing channels with the same polarity should be faster, right? Well, maybe it should, but ... in my own tests, it takes no less time to switch from channel 502 (on BEV that's CBC Newsworld) to channel 500 (CNN) than from 502 to 503 (CityTV Pulse24). 2. Waiting for an "I-frame". With the MPEG-4 compression that's become pretty well the standard in digital video transmission, the complete image is typically only transmitted every couple of seconds, in what is called an I-frame (an Intra-frame), with updates to that image transmitted several times a second, in P-frames (predictive frames) and B-frames (bi-directional frames). When you select a new channel, either by surfing up or down or by entering its number directly, the digital converter must wait for the next I-frame to be able to display a starting image. 3. Writing the data and reading it back. If you are watching on a converter that is also a PVR programmed to use the "always recording" feature (as are most PVRs), you must also wait for those frames to be recorded to and read back from the PVR's hard disk. This delay of course does not exist with a standalone, PVR-less converter. 4. Converting the digital signal for display. The final element contributing to the delay is the conversion of digital I-frames, B-frames, and P-frames to the analog signal to be sent to the TV. This size of this delay is a direct function of the speed of the converter's processor(s). The BEV model 5200 PVR has a 120 Megabyte hard disk, enough space to store about 100 hours of (non-HD) video. After just a week of recording and watching and collecting, I could see that it was going to be hard to keep my PVR's hard disk usage down. Less than four weeks on the dish, just a few days before the end of my free month of movies, the available space had dropped below 40 hours. Soon I had just 25 hours available, and I knew from my own and others' bad experiences with "too full" computer hard drives that it was time to start pruning. Some advise not to worry with today's larger PC hard drives until they reach 90% full; the more wary say to show concern at 75% full. The actual danger point is a combination of percentage and absolute space available, and technical hardware and software details. So I decided to be concerned when my 5200 PVR was down to 25% free space, and do a panicky pruning when it gets down under 10%. In the first few weeks I encountered a few minor problems with my new BEV system, including gaps of less than a second in PVR playback, occasional losses of sound on playback or channel startup, and occasional odd behavior on the (very handy) command to "skip forward 30 seconds". More scary was were the times that the 5200 froze after I'd directed it to update its programming guide (which shows only the next three days of scheduled programming). The first time that happened, for about a minute pressing buttons on the remote control didn't change that message display, but then the system unfroze, and I pressed power-off. When I turned the 5200 back on, it restarted with a display of a "system error" message that contained the BEV order/support phone number. But I'd been through enough voice jails that week, so I turned it off again and decided to hope everything would be all right. When I turned it later it displayed no error messages and worked fine! A similar freeze occurred the next week, again displaying a "please wait" message, again after I had directed the PVR update its programming guide. I did that while I was also watching a previously recorded program, just after the recording of another program had just started. That's just the sort of simultaneous activity that I've seen overloading and disabling MS-Windows. (I should have known better? Read my lengthy defense here.) This time I waited longer ... and in a few minutes the 5200 shut itself off. Uh oh! "What's going to happen when it I turn it back on? Will it even start up? What will it have done to my data?" Well, it started normally and nothing much bad had happened. The system hadn't updated its programming guide, but it hadn't lose any of my recordings or settings; after missing a few minutes of the broadcast, it began anew to record the program that had been interrupted by the freeze and crash. When I tried again to direct it to update its programming guide, this time it succeeded. But twice it got stuck for two or three hours downloading guide updates, on one of those occasions rejecting my attempts to CANCEL, thus disabling all its other functions, including viewing of recorded video. I found other things to do with my time for a while, but after a couple of hours returned to find the PVR still "downloading". I phoned ExpressVu to complain about the total failure, but after twenty minutes of Muzak and Bell ads, and before a technician answered my call, the PVR completed its updates and became fully functional. Compared to other computerized products I've used, I the BEV system seems pretty good. The user interface is not perfect, but it's largely intuitive, with sensible alternate behaviors for common functions (like the remote control's CANCEL button). And the Satellite signal quality is so much better than my old analog cable signal that my 20 year old big tube TV looks to me like a High Definition plasma screen! In my first months as a BEV client there were a few outages. A severe spring thunderstorm alerted me to a disadvantage of receiving live video by satellite. At the peak of the storm my 5200 PVR and 4100 receiver both reported that they'd lost the satellite signal. In an hour or two the worst of the storm passed, and the signal was automatically reacquired. But during the outage I couldn't watch or record live broadcasts (though I could use the PVR to watch prerecorded video). I'd heard some stories about the low quality of the Rogers digital cable TV signal, and with their analog cable TV I had experienced a snowy picture about once a month, especially on the lowest-numbered channels. In my first month with BEV, the signal was sharp on all channels, with only a few occasional, very brief drops in the quality of video or audio. Then there was the time when my receivers lost their satellite signals for three solid days, during which my video habit had to be fed by recordings (of which my PVR had about 70 hours). My live TV link dropped the day after a heavy rainstorm and a local power failure, which seemed to be the most likely causes of the failure. After a half-hour on the phone, directing me to fiddle with various 5200 and 4100 "Installation" screens displayed, a BEV agent told me that a technician would have to visit to check for what could be a satellite alignment problem. Because my three month installation warrantee had expired, that would cost me $75. It was an offer I couldn't refuse; but the first available appointment wasn't until three days later. When the technician arrived (driving he said to my midtown location from the suburbs), he went to the basement and immediately discovered that a ceiling-mounted AC/DC converter for the outdoor LNB was plugged into a AC power bar that had been turned off. My lost signal problem had nothing to do with the previous night's rain storm or power failure. A flick of the switch on the power bar and the satellite signal was restored ... and a $75 charge later appeared on my next bill. Overbilling: An Initial Charge of $650! Since ordering ExpressVu, I have received only one bill that I didn't dispute. Bell may be trying to make up for undercharging on installation and PVR sales and rentals by aggressive overbilling. Three weeks after my ExpressVu installation, my bell.ca "e-bill", which previously had sections only for telephone and Internet service, had a section for "Television" added, with no details about that service (which should have included bonus programming credits). But there was a $649 charge for "Other Charges and Credits" in the "Telephone" section of the bill. I had been charged for the purchase of a model 9200 PVR, which I had actually ordered as a $20/month rental, then cancelled. During a twenty minute phone call to BEV billing (half of it waiting and fuming on hold), I was told to ignore that superfluous charge, because my actual charges (and hopefully my bonus credits) would appear on my next bill. That bill appeared in a couple of weeks, and it had the same error (plus "late payment" charges). By the time that $649 charge was removed from my bill, four months later, I had communicated with over a dozen different Bell employees. I quickly stopped telephoning, after my initial torture in Bell voice jails, and communicated the progressively more complex details of my account through email ... dozens and dozens of emails. During that time I got one a dunning email message from the Bell credit department threatening me with disconnection of services if I didn't pay my "outstanding balance". (Each month, on time, I paid what I calculated to be the correct balance due, which was of course at least $649 less than the balance on my bill.) When I received another demand for payment, this time by phone, and I just lost it ... I didn't let the Bell agent say much at all, demanding that he correct what was clearly Bell's error, and I hung up. I sent more emails, including one to executive.office@bell.ca listed at the front of the telephone book (from whom I never received a reply). On my fourth monthly bill, the incorrect $649 charge was finally removed. But that bill showed $13 in "late payment fees", probably an artifact of the large overcharge's three month billing lifetime. After more emails, on my fifth bill I saw those fees reduced to 86¢ (Huh???). But as had the previous four bills, that fifth bill was missing the $20 refund for PVR rental promised for the first year of my two year contract. I made an appropriately reduced payment on that bill, and on the next seven bills, all of which had at least a $20 overcharge. In December (my ninth bill) I finally saw a bulk $120 credit to compensate for their systems future overcharges that apparently can't be stopped. Wouldn't Bell be losing money on my account? Even with underpaid, offshore customer service agents responding to my messages. aren't their labour costs excessive. Aside from the billing nonsense, I've found the ExpressVu service pretty good. Severe thunderstorms have ocassionally resulted in "lost signals" or pixelated video, but I haven't been irrecoverably deprived of any "must see" programs. The PVR's timers can be set to record programs by name, instead of by seeting date, time, and channel looked up in the paper TV guide. And with timers set for stations in multiple time zones, the PVR seems to magically resolve conflicts in recording requests. Timers are set from an on-screen TV program listing which usually includes descriptions (ExpressVu shows only the next 44 hours of listings). 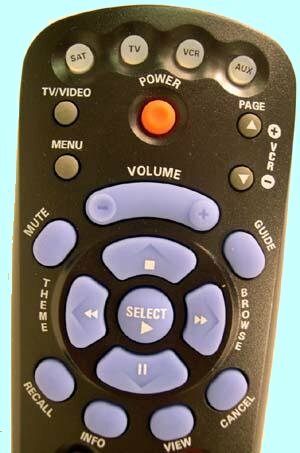 To watch a recorded program, I select from an alphabetically ordered list of recordings, where a single click on the INFO remote control key displays the description of a selected program. With another couple of clicks I can play a program from the beginning, or from the point I last stopped viewing it (just like ejecting and reinserting a half-watched videotape). Of course when the online guide is up-to-date but incorrect, it's as hard as the worst VCR to program the PVR to record the shows you want (entering date, start time, end time, channel). But I've only noticed guide errors a couple of times in the nine months I've had the service, and those errors were corrected about twelve hours before the broadcasts began (no doubt in reponse to other viewers' complaints). When the guide is out of date, the timer list is entirely blank, as if all the timers were lost (which can be a bit frightening when your list of timers is approaching the 96-time limit). The guide is normally updated at night when the PVR is not being used, but occasionally it asks to be allowed to update its guide, which normally takes less than the two minutes it warns that will take. With a standard ExpressVu package I receive Canadian network programs from several stations in multiple time zones, and I pay an extra $1 a month for time-shifted East/West coast American network channels. The resulting variation in broadcast times for the same programs gives me a flexibility in recording that expands my two-tuner PVR's ability to record just two programs at once. I've been a collector since my teens (coins, stamps, books, computer software, fridge magnets, coffee mugs), and since the early days of Beta I've collected video, so I often run into my PVR's 100-hour recording limit. I frequently discover broadcasts that I want to watch, but maybe not right away: new series, old movies, documentaries, classic performances. There's not enough room on my PVR to keep them all, so I'm constantly pruning my collection. My two-year contract is long over and I'm still paying Bell on a month-to-month basis. (in hindsight I guess I should decided to buy, not rent the PVR.) Occasional storms can block the satellite signall. But the PVR hasn't locked up very often, and it's never trash my recordings or timer events (of which I have over 75).